Our smartphones have become our primary cameras these days, thanks to the ever increasing image quality captured by them. And thanks to the large vibrant displays, we can view and relive our awesome memories right on our smartphone devices. Every smartphone comes preinstalled with a photo gallery app that allows the users to view the photos they have taken with their smartphone camera. There galleries also allow the user to view additional details about the photo, like their location and size, as well as directly open them in their favorite app for editing. Android smartphone brands like LG, Samsung, Xiaomi all preinstall their own custom gallery with built in editing tools and other features. However, if you do not find the built-in gallery app intuitive to use, don’t worry. In this guide, we will tell you about the best photo gallery apps you can use on your Android smartphone. By the way, you don’t want your precious photos to collect dust in the Gallery? Why not make a photo album with songs on your Android? 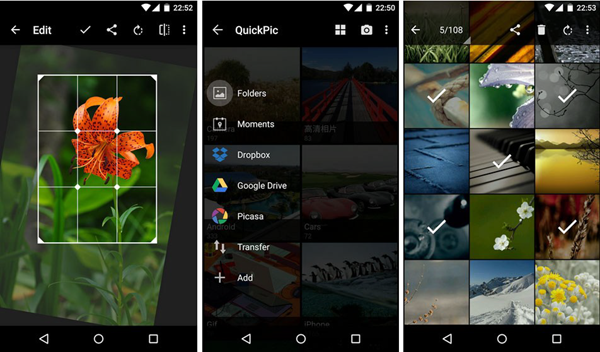 QuickPic is considered as the best Android photo organizer app, which features lightweight, integration with all popular photo services and convenient file management. The application is free and no ads are inserted, and has a simple built-in photo editor, support for most multimedia files and basic functions, such as renaming photos, creating albums and supporting a variety of cloud services. The application displays all the images and videos that are in the memory of the smartphone quickly. You can only specify certain folders for scanning, or you can trust the business to automate. Photos and videos can be copied or moved between folders literally in a couple of clicks. Gestures and multitouch are supported. You can work either with individual media files or with whole folders or selected groups with an arbitrary number of files. All this at the maximum speeds available to one or another device. This is a photo gallery app that is usually preinstalled on all Android smartphones, along with the other main Google apps. Although, Google photos is aimed as an app to backup and access photos stored in the Google Photos cloud service, it is not limited to it. One can simple use this app as a photo gallery replacement. All photos are displayed in one single scrollable timeline categorized by date. Google’s image prowess is well known, thanks to its advanced machine learning algorithms. This carries forward to this app as well. You have many editing tools for photos. There are multiple filters and an auto enhance feature. If you like tinkering with settings manually, you have that option as well. Even for videos, there is an option to trim, as well as stabilize shaky videos. Overall, this app by Google is a definite first option to try out if you don’t like your current photo gallery. This is another amazing and easy to use photo gallery app. By default the photos are shown in timeline view, however swiping from left side reveals all the individual folders present as well. Swiping from right side gives options to filter by images, videos or date. The app is very light weight and easy to use. But it has no built-in editor except image cropper. However, clicking the pencil icon when viewing any photo, shows options to edit it using any of the installed photo editing apps. If you liked the simple gallery apps of old Android versions, then this is the app you should try and use. It has a very basic and simple layout, akin to its name. The main screen has large squares depicting various folders present on the device with a number denoting the images present in that folder. Clicking any square opens that folder to view all the photos in that folder. It has no built in editor but one can view image info. 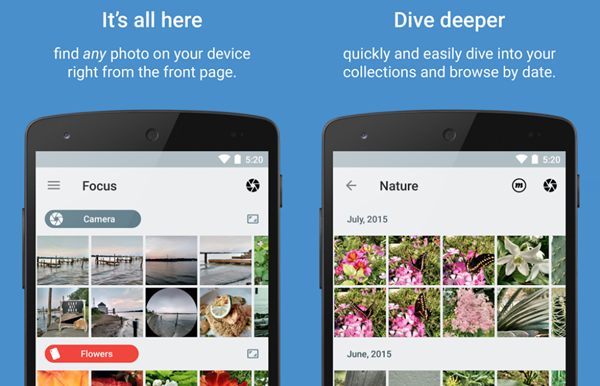 Focus is an incredible Android photo gallery tuned for speed, efficiency, and ease of use. It features a powerful tagging mechanism to access and organize your albums. All your pictures and videos will be accessible from the main page without the need to change context with an intelligent vertical & horizontal navigation. It features password protection as well to keep your images safe from prying eyes. We hope this list will be helpful to you in finding the right photo gallery app for your needs. 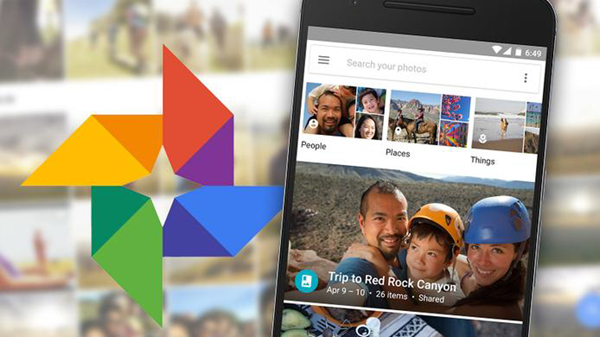 In our opinion, nothing beats the Google Photos app in terms of features. 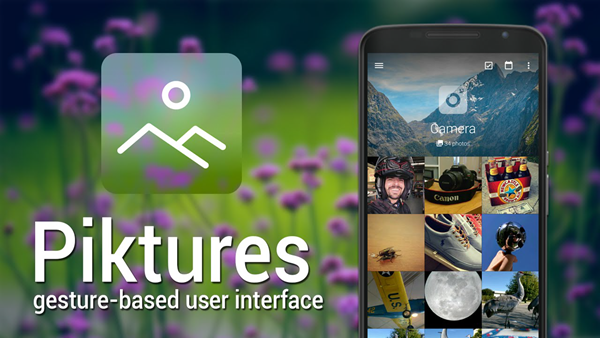 But if you want the most light weight and yet elegant picture gallery app, Piktures is our clear favorite. 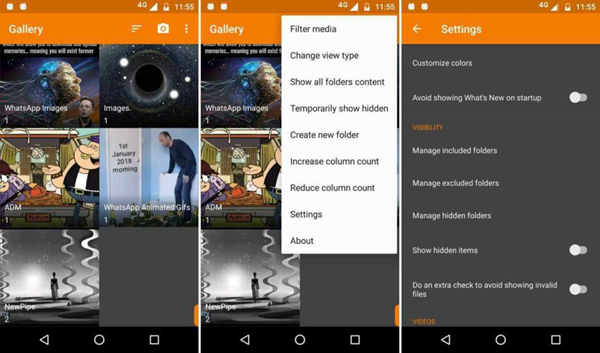 Last but not least, though these gallery apps can help you keep and organize your images perfectly, they can not prevent you from photo loss on your phone. Hence, it’s strongly recommended to backup your photos regularly, otherwise you have to recover deleted photos from Android Gallery once data loss happens. 5 Cases that WeChat won’t Let You Login. How to Fix?